TLDR | What Does TLDR Mean? TLDR (Too Long Didn't Read) is typically sent in response to someone sending a lengthy article or asking for an opinion on a lengthy article. It is often said that the length of a document is directly proportional to how quickly it's read. This has always been the case, but – particularly since the rise of the internet – people are no longer willing to read through lengthy texts. People expect to find the information they need instantly or to be entertained instantly. In other words, lengthy business articles and wordy jokes are far more likely to be ignored than summaries and cartoon-style jokes. This image shows a girl looking a lengthy article that she has no intention of reading. Person A: Did you laugh at that story I sent yesterday? Person A: Do you have any comments on the draft before we submit it? Person B: TLDR. I suppose that's a comment. 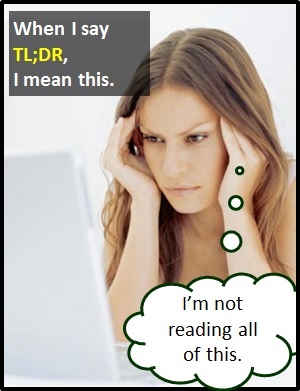 TLDR is a shortened version of "It was too long; I did not read it." Person A: Well, I didn't expect that ending! TLDR is an initialism abbreviation. This means it is pronounced using its individual letters (i.e., Tee El Dee Arr). Initialisms contrast with acronyms, which are spoken like words. If TLDR were an acronym, it would be pronounced tilder.